Pycnogenol is a potent antioxidant, containing a group of substances called bioflavonoids. The richest source of Pycnogenol is the French Pinus Maritima, which grows in the immense pine forest along the southern part of the French Atlantic coast. Knowledge of the medicinal benefits of pine bark extract has existed for centuries, and in 1987 the Pycnogenol was registered with the United States Patent Office as a medical substance that "devours" free radicals. Pycnogenol is currently known as an essential nutrient not only in the United States, but also in many European countries, where it has been used to treat retinal problems in diabetics for years, and in Finland, where it is most commonly used to relieve bouts of hay fever. Pycnogenol is used in many countries around the world for a wide variety of purposes due to its potent antioxidant activity and lack of side effects. In his book "The New Super-Nutrition" (1991), Dr. Richard Passwater, a world renowned American biochemist, writes: "Pycnogenol is a member of the bioflavonoid family. It can be derived from grape or vine seeds, but the preferable source is pine bark, especially that growing along the French coast". "Its high antioxidant level," explains Passwater, "is the source of its potency and variety of therapeutic advantages: delaying aging processes, preventing cancer and heart disease, improving skin condition, preventing senility, preventing cataracts, relieving arthritis and more." Pycnogenol is fast acting: it is absorbed into the circulation within 20 minutes and makes its way to the tissues. Within an hour of ingestion, Pycnogenol can be found in the saliva. During the 72 hours Pycnogenol remains in the body, it neutralizes free radicals and prevents oxidation. Free radicals are formed in our bodies due to the reaction of fat molecules with oxygen, a process similar to cooking oil turning rancid following over-exposure to sunlight. Free radicals are also formed during normal chemical processes, such as the metabolism of unsaturated fatty acids. The constant presence of the free radicals in the body and their destructive effect on cells has been well known since the 1950s. Fortunately, our bodies are equipped with special defense mechanisms in the form of enzymes, which absorb and neutralize the free radicals. Among these enzymes are glutathione peroxidase, which requires the mineral selenium in order to halt the oxidation process, and superoxide dismutase (S.O.D. ), which requires the minerals zinc, copper and manganese in order to complete the neutralization process. Nutritional antioxidants are nutritional elements that support this enzymatic activity. They prevent the harmful chemical reactions that are stimulated by the free oxyge radicals and the peroxides. The main nutritional antioxidants include: vitamin A, vitamin C, vitamin E, selenium and beta carotene. Collagen is the major skin protein and is responsible for skin texture and flexibility. Pycnogenol can "activate" destroyed collagen and renew the elastin connections. It wraps around the fibers and restores their initial form. This protective action makes the skin smoother and more flexible, moisturizes it and helps prevent premature ageing. Pycnogenol also protects the collagen from additional assault by free radicals and enzymes that cause its breakdown (collagenase and elastase). It acts as an internal and external "radiation filter" and prevents sun damage. Pycnogenol enhances the function of vitamin C on capillary blood vessels` walls and strengthens capillary collagen. Pycnogenol helps maintain the flexibility of red blood cells and enhances their resistance to disease. It strengthens capillaries, arteries and veins, protects them from hemorrhage, varices and injury and reduces the risk of inflammation, edema and swelling. Pycnogenol is essential to brain functions, not only because it protects blood vessels, but also because it is one of a small number of antioxidants capable of easily crossing the blood-brain barrier and providing the brain cells with direct protection. Strengthening other blood vessels helps prevent strokes. One study demonstrated that Pycnogenol significantly increased the life span of mice with genetic hypertension, prone to premature death due to strokes. Protecting brain cells and enhancing the blood circulation that provides their nourishment helps to improve memory, maintain normal cognitive function and reduce senility. Pycnogenol`s ability to improve joint flexibility and restore collagen in connective tissue has also caused great interest among athletes. As mentioned above, collagen is the main protein element in bones and concentrated ingestion of collagen helps prevent osteoporosis. Pycnogenol also inhibits the activity of enzymes involved in inflammatory processes, and so prevents and even treats arthritis, reduces inflammatory conditions caused by sports injuries, and relieves certain types of headaches. Directions: One capsule per day, with meals. 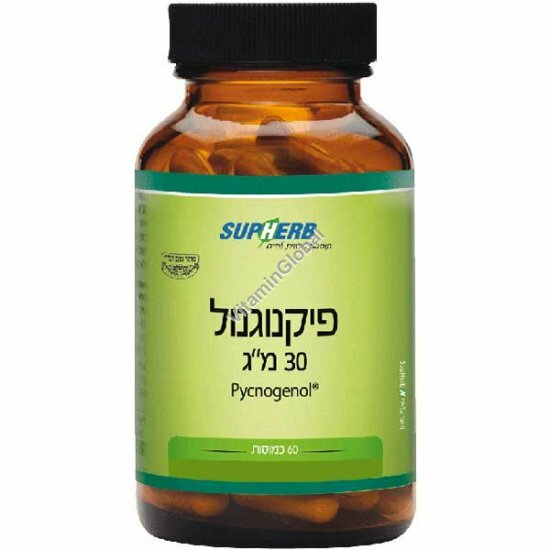 SubHerb`s Pycnogenol is available in packages of 60 capsules.